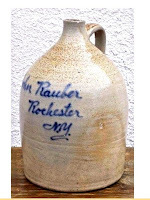 Beginning at unusually early ages, two generations of the Rauber family operated a thriving liquor business in Rochester, New York. Their enterprising ways could not prevent them, however, from suffering a series of untimely deaths. The sons of Stephen and Helena (Gregorius) Rauber, the Rauber brothers, John and Peter, originally were from Wayland, New York, where their father, an immigrant from Germany, was a well-off farmer. John was the first born in 1850; Peter followed in 1858. Formal education for both boys ended in their early teens. Farm life apparently had little or no appeal and they gravitated the 50 or so miles to the big city, Rochester. John was the first to arrive in 1866, sixteen years old, and working as a driver for the Rau Brewery, a Rochester beer-maker founded in 1854. According to a biographer: “Active and diligent he won the esteem of his employers and gained promotion from time to time with a corresponding increase of wage that at length enabled him to save a sufficient amount to engage in business on his own account.” John was listed in the 1875 New York State census as a “beer peddler” that may indicate owning a saloon. 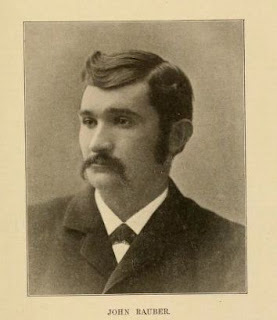 In the meantime, he had married Mary A. Raymer (sometimes given as “Rayner”), a New York native. They would go on to have a family of nine children. 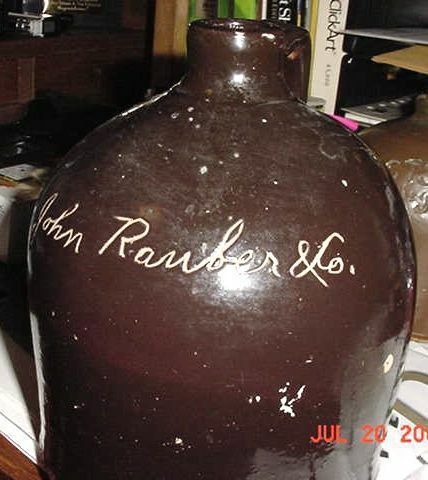 Peter arrived later and although only 20 years old appears in 1878 almost immediately to have launched a liquor house called P. F. Rauber & Bro., with John as his partner. The company was self-described as “Importers and wholesale dealers in wines, brandies, gins, old bourbon and Monongahela whiskey. Manufacturers of double rectified whiskey and spirits, copper distilled whiskey.” It advertised extensively in Rochester and environs. The Rauber brothers were not shy about letting the public know that in addition to being liquor wholesalers, they also were “rectifiers,” that is, blending whiskeys to achieve particular taste and color. Among the brands they were mixing up in their several progressive addresses on Rochester’s West Main Street were: "Belle of Monroe,” "Belle of Rochester,” "Brunswick Rye,” “Champlain,” "Double Rectified,” "Eagle Rye,” "Flour City Club,” "J. R. C.,” "North King,” “Plumsure,” and "Wheat Malt.” Shown here is a salt-glazed stoneware jug with “P.F. 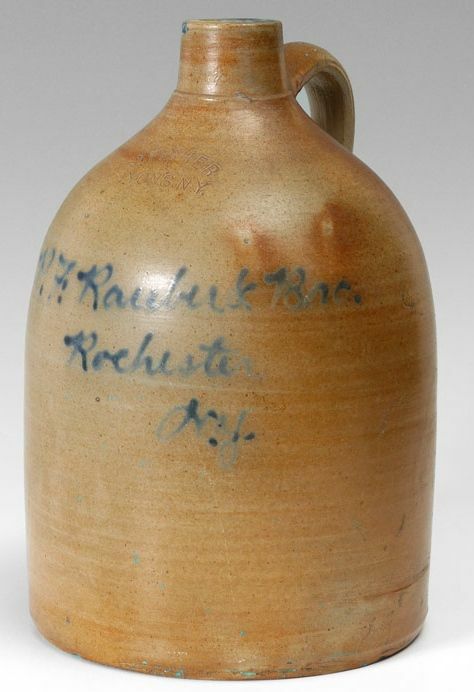 Rauber” written in cobalt, likely for whiskey sold wholesale to local drinking establishments. 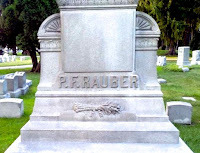 After 18 years at the helm of the Rauber liquor house in April 1896 Peter died at the early age of 38, leaving a young widow and three minor children -- all girls. The thought of his family needing to go on without him must have meant intense sadness. 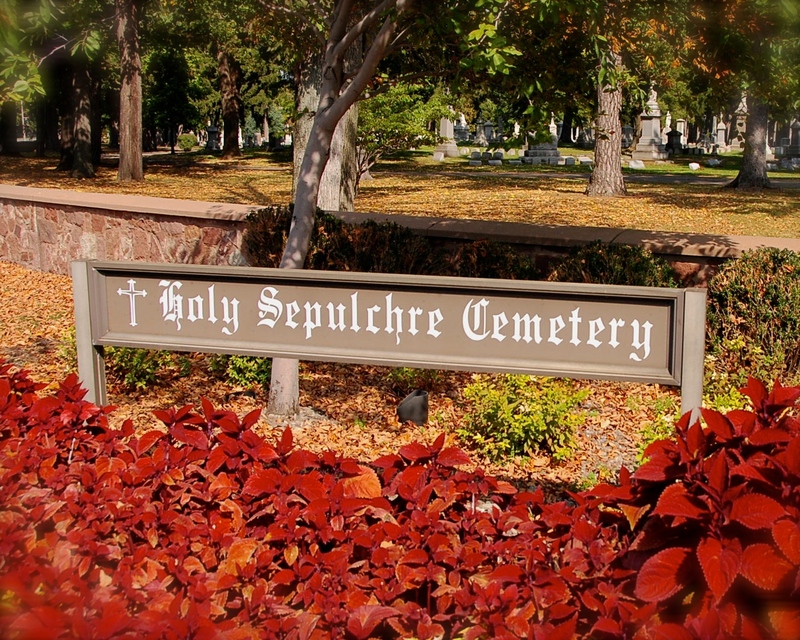 Peter was buried in Holy Sepulchre Cemetery in Rochester. A large granite monument marks his grave. 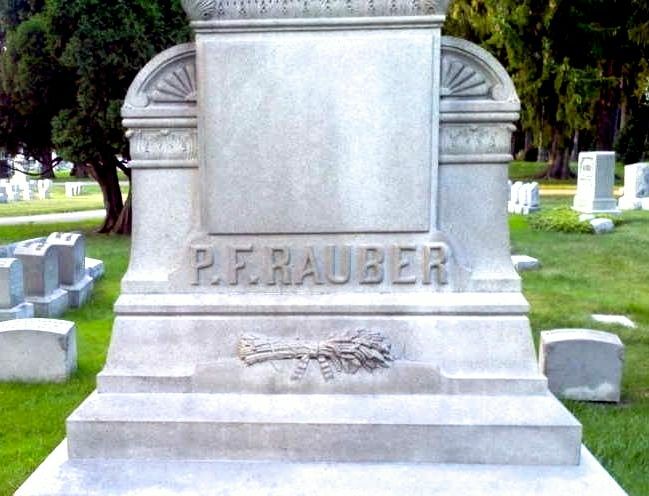 With his brother's death, John Rauber took over the management of the liquor firm and changed the name to his own. Two whiskey jugs are found with that name on them. At left is a crudely made ceramic container that has “John Rauber” impressed into the surface. A second jug with that name is salt glazed stoneware with the name in cobalt script. 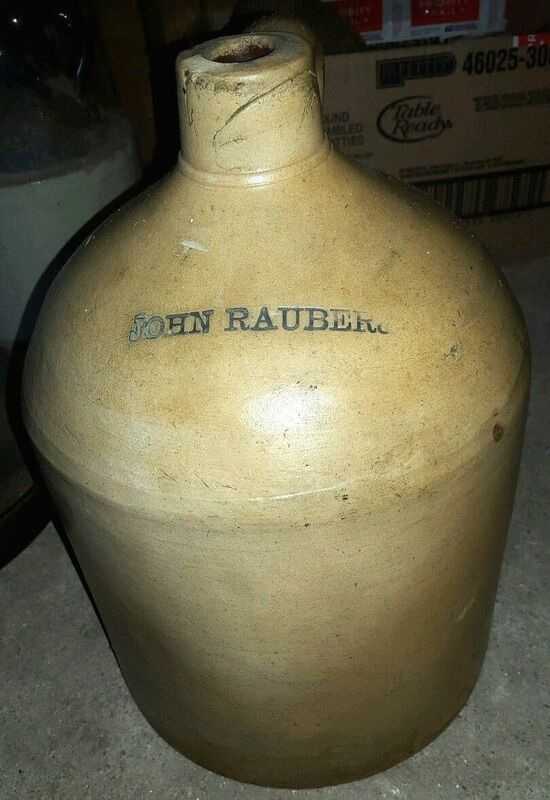 These jugs likely were produced during the 16 months that John Rauber was guiding the fortunes of the family liquor house. Then at the relatively young age of 47 in August 1897 he too died. John S. was responsible for some changes at the liquor house. He altered the name to the John Rauber Co. and brought a younger brother, Henry P., into the business as an associate. For the first time the firm trademarked two of its proprietary brands: “Belle of Rochester” in 1905 and “Plumsure" in 1910. 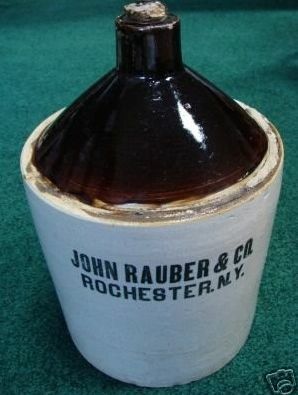 In 1905 he introduced new brand of whiskey, calling it “Rochester Club.” It became popular and helped him double the sales of John Rauber & Co. during the first decade of his management. He also reformed internal operating systems that resulted in dollar savings. In addition to shouldering the responsibilities of the liquor house, John S. found time for love and marriage. At the age of 27 in June 1906, he married Anna A. Lynch, the daughter of a Rochester widow, Catherine Lynch. Just over a year later a daughter was born; they named her Eunice Catherine. Rauber became socially active in the city, a member of the Rochester Club, the Rochester Whist Club, and the Elks, and was recognized as an “expert gentleman driver” in local sulky racing circles. Not all ways were smooth for John S. In 1909 he purchased a life insurance policy for Charles Rauber, when his younger brother reached twenty years old. The policy from Mutual Life Insurance Co. of New York contained a clause that in effect cancelled it if Charles became involved in an “extra hazardous” occupation, including the liquor trade. Notwithstanding that prohibition, John S. transferred a one-ninth ownership share of John Rauber Co. to Charles. When the young man died a year later the insurance company refused to pay off on the policy. John S. sued but lost, the New York Court of Appeals finding that the clause was valid even though Charles had taken no active part in the liquor business. Then came National Prohibition. The Rauber family liquor house was forced to shut down. John S. and his family continue to live in Rochester after its imposition in 1920. Six years later he died, still a young 47, and was buried with other family members in Holy Sepulchre Cemetery. After Repeal in 1934 neither the liquor house nor any of its brands were resurrected. There is a great deal to respect about the Raubers. Responsibility early descended on them. It came to John at age 16, to Peter at 21, to John S. at 17. They accepted the challenges and succeeded. They also knew too well the sorrows of early death. The end came to Charles at 21, to Peter at 38, and to both John and his son John S. at 47. 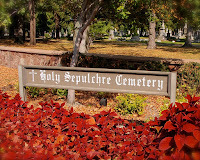 Today they all lie together with other relatives in a family plot at Holy Sepulchre Cemetery. Requiescat in pace. Dear Patricia: Thank you for your correction about Peter Rauber having married. I will make the change above and here give you credit for the accurate information. Dying as he did so early Peter must have left a young widow and children -- making the story of the Rauber deaths even more touching. Thanks for being in touch.